Our Holiday Program is designed for those wanting to try more than one sport and gain a variety of skills. This quality multi-sports program provides a range of activities for children of all abilities. Soccer, Football, Cricket, Swimming, Tennis, Basketball, T-Ball, Frisbee, Volleyball and more. 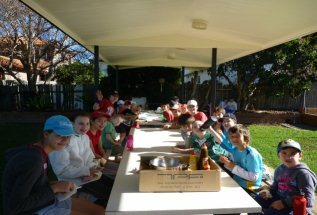 A sausage sizzle is provided daily, however a healthy lunch pack can be pre-ordered by you or your child each morning before commencement of the camp.